Trying to decide between a trip to Disney World or a Disney Cruise is difficult if you haven't experienced either. While many people expect these two Disney vacations to deliver a similar experience, nothing could be farther from the truth. Walt Disney World consists of four unique theme parks and water parks. In addition, there are events and spectacles that take place at certain times of the day. You'll probably have a long list of rides, shows, and experiences your family is looking forward to. In order to do it all, you may end up exhausted. A Disney Cruise, on the other hand, has plenty of Disney magic, shows, and characters but you'll be experiencing it all in one place. Your vacation may be laid back, but will the kids get to do all they want for their Disney experience? With more information, you can huddle with your family, find out what everyone wants to do, and decide on going to Disney World vs. Going on a Disney Cruise. Sprawling over a whopping 43 square miles of the Orlando area, Disney World includes four theme parks (Magic Kingdom, Epcot, Animal Kingdom, and Hollywood Studios), two major water parks (Blizzard Beach and Typhoon Lagoon), over two dozen Disney resort hotels, ​and about a dozen non-Disney hotels, a campground, four golf courses, plus the Disney Springs shopping and dining neighborhood. 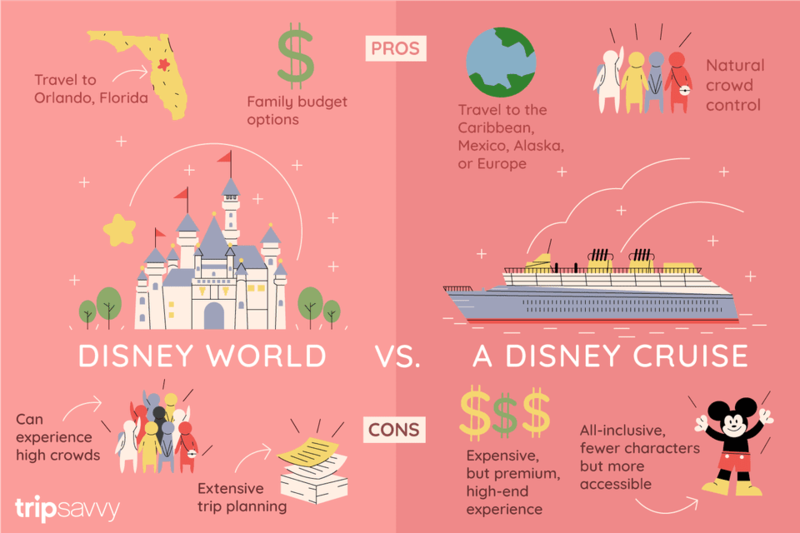 By comparison, the world is your oyster with Disney Cruise Line. Disney's four ships depart from various ports in the United States and travel to the Caribbean, Mexico, Alaska, and Europe. The Disney Cruise Line blog has a page that shows the current location of all four Disney ships. Does your family like to travel? If so, a cruise might satisfy the travel bug plus the desire to have some Disney fun. But if your kids have their hearts set on riding their favorite rides and seeing the end-of-day fireworks shows at Disney World, there is a compromise. The proximity of Orlando and Port Canaveral, Disney Cruise Line's busiest port, makes it easy to combine a theme park vacation with a cruise vacation on the same trip. Disney offers land-and-sea packages that typically combine three days at Disney World and four days on a Caribbean cruise or vice versa. As you would expect given Disney World's mammoth size, there is a never-ending cavalcade of rides, attractions, restaurants, water parks, parades, fireworks, shows, shops, character meetings, and the like. You can, and should, carve out some downtime during your stay and relax by your hotel pool. Still, you'll want squeeze as much fun as you possibly can out of your days and so you'll inevitably be on the go most of the time. Wear comfortable shoes and expect to return home wiped out with kids who are enthusiastically telling their friends about all the rides they went on and showing pictures of their selfies with the Disney characters. If you imagine that a Disney Cruise is like a floating theme park, you're in for a surprise. The closest thing to a ride on a Disney ship is the AquaDunk water slide on the Disney Magic and the AquaDuck water coaster on the Disney Dream and Fantasy. Of course, there is a seemingly endless array of ways to have fun on the ship, between the pool deck, kids clubs, scheduled workshops and live shows, games, movies, and parties. But the kids have to be interested in non-ride experiences. Even so, the pace on a Disney Cruise is far less go-go-go than at a theme park, and most people find it more relaxing. For this reason, if you book a land-and-sea package, do the cruise after the theme park. A vacation package at Disney World typically includes a hotel stay and theme park tickets, so it's possible to spend less by choosing a value property. With over two dozen Disney-run resorts, there are plenty of options for every family budget, from campsites to value-minded hotels to deluxe villas with separate sleeping and living areas and kitchens. A family of 4 can enjoy a 6-night, 7-day vacation package at a Disney’s All-Star Resort with tickets valid at all 4 theme parks for as little as $98 per person, per day. On the other hand, Disney Cruise Line is a premium line that delivers a high-end experience. The ships are downright gorgeous, with lavish Art Deco or Art Nouveau lobbies, amazing themed restaurants, and wonderful kids clubs, activities and pool decks but it's not Disney World. Rates on Disney Cruise Line come much closer to all-inclusive pricing than on most mainstream cruise lines. The food in the three main restaurants is on par with the best signature restaurants at Disney World. In other words, passengers pay more than on some other cruise lines but also find an awful lot of value. For the best time to visit Disney World, take into consideration a combination of weather, crowds, and prices. While theme park tickets are constant throughout the year, ​hotel rates fluctuate quite a bit during the year and, of course, tend to be lower when kids are in school and pricier during summer vacation and other school breaks. Similarly, rates for a Disney Cruise tend to rise during school breaks and holidays and fall when kids are back in school. That means you can often book at the last minute—which, in cruise speak, means between two and six months in advance—for a cruise taken January through early February, May, late-August through October, and the non-holiday weeks in November and December. 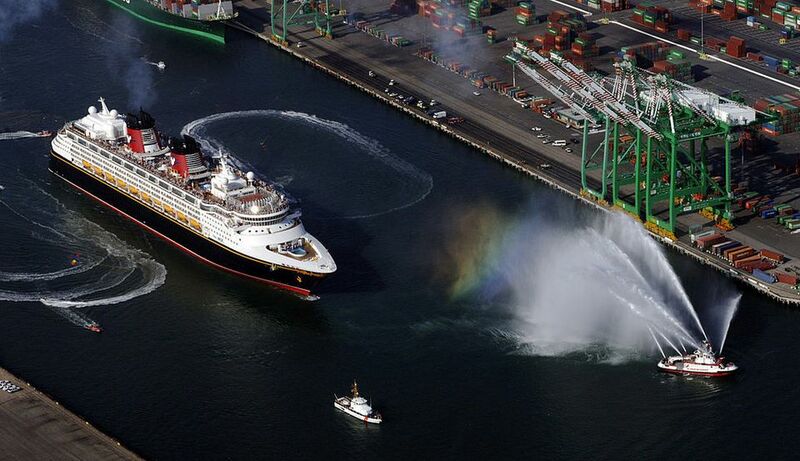 If Disney's cruise ships have an advantage over Disney parks, it's that they have natural crowd control. Even during spring break or the Christmas holiday season, a ship can only hold a certain number of people, so it's no more crowded than at other times of the year. To get the most from a Disney World vacation, you can plan much of your trip before you leave home with a system called MyMagic+, which bundles nearly every aspect of your trip together. Instead of a ticket, you get a MagicBand, a rubber bracelet containing a computer chip that holds all the components of your Disney World vacation—theme park ticket, room key, dining reservations, PhotoPass—and it also acts as a resort charge card. FastPasses have been replaced by FastPass+, a digital version of the line-jumping system that can be managed from your smartphone with the My Disney Experience app. You can book the most popular dining experiences six months in advance and FastPasses 60 days in advance (or 30 days in advance if you're not staying at a Walt Disney World Resort). With a Disney Cruise, there are fewer moving parts. Your meals and most activities are included in your fare. Once you choose your stateroom and book your cruise, other experiences you may want to book in advance include shore excursions, spa treatments, and optional adult-exclusive dining reservations. Even after you board the ship, you can frequently book these experiences at the guest services desk on the ship. The verdict is split on this one. Disney World certainly offers a much wider array of characters in its shows, meet-and-greets, and character meals. But while there are fewer characters on a Disney Cruise but the interactions tend to be more accessible and low-key. Beyond the many scheduled character meet-and-greets on the ship, your family is likely to randomly run into a character or two on the pool deck, in the kids' clubs, or even on Castaway Cay, Disney's private Bahamian island.